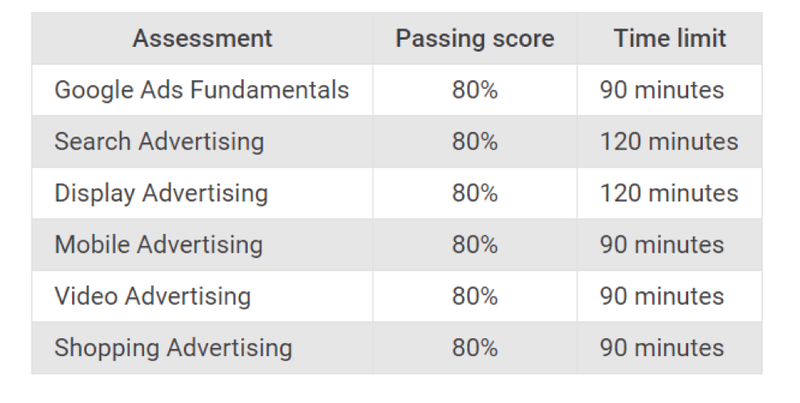 Google Certification Guide: the best courses, exams required, and costs to become Google certified with Google Analytics and Google Adwords. This guide to become certified with Google products helps beginner, intermediate, and advanced marketing and digital media professionals. We examine the learning paths, exams and assessments that will help you receive your Google Certification. How to Become Google Certified with the Best Courses, Exams, & Training Required for Analytics and Adwords. How do you get Google Certified for Google Analytics, Adwords, or the Google Marketing Platform? And what are the benefits of Google Certification? You may have heard of Google certification before. But if you were unfamiliar, chances are you don’t know what it is. But we are here to answer every question you have about the Google Certification process and program to become certified. How to become google certified - Best courses, exams, and training tutorials. Google Certification is Google’s credentialing process. Google awards certification to students who have completed one of its assessments, including the “Google Adwords certification” and “Google Analytics certification” exams. Google offers comprehensive and free courses for many of their digital marketing and SEO products, including Google Ads and Google Analytics. Google certification is available for people who have completed these courses and have passed the required assessment for a particular area of expertise. You might be wondering: Do I need to get Google Analytics certified? Or what do I need to do to earn AdWords Certification? Whether you’re a business owner, an SEO specialist, or you are an aspiring digital marketer, getting Google certified can be a valuable way to improve your expertise with certain Google products, including Ads, Analytics and Campaign Manager. Want to Learn about Google Certification? The good news is, earning Google Analytics and AdWords certification is absolutely free. Plus, every course is self-paced; you can complete them in a day, or over weeks or months. In other words, if you’re interested in learning more about a Google product, or you want to showcase your expertise for prospective clients, certification does just want you need. What is Google’s Academy for Ads? Why You Should Become Google Certified? Google certifications have been around for more than a decade. These certifications have been how Google educates its users about their products, and then take a test to showcase their expertise. Until recently, certification was done through the Google Partners program. Launched in 2013, Google Partners enabled marketers and SEO specialists to earn certification and display a Google Partners badge on their websites. This year, the Google Partners program has been replaced. Now, all of the courses for Google Certification are available in the newly-launched Academy for Ads. Academy for Ads is now Google’s home for training and certification, as the platform replaced the Google Partners program back in January 2018. Academy for Ads is Google’s online learning hub for all advertising products. On the platform, you can create an account, browse courses, begin completing coursework, and ultimately, take a certification exam. The Academy, along with Google Analytics Academy, offers robust courses and training for Google’s SEO products. You can pick up any courses you’ve already started; they’re displayed just below the Academy for Ads Banner on the homepage. Take a look at the catalogue for all the offerings. You can browse courses by product as well. The planning tool makes it easy to set goals and reach them. You can also visualize your learning plan through the planning hub. The notifications tab gives you new course alerts, new feature updates, and other useful information. On the homepage, you can do a quick search of the course catalogue, as well. Tip on Google’s Academy for Ads: In Academy for Ads, exams are now known as “assessments.” To earn a certification, you will need to pass the certification assessment. Why Should You Become Google Certified? Getting Google certified takes up to seven hours per course. So you will be investing some of your time. But enrolling in a learning path and earning the certification offers clear benefits for students. These are top-notch Google Adwords training and Analytics learning programs. Following these learning paths will help you better understand these tools, and be able to attract new clients. Whether you have on-the-job experience, or you’re new to a particular Google tool, the Academy for Ads and Google Analytics Academy learning paths can help you learn new skills, enhance your proficiency, and gain a more comprehensive understanding of a particular tool. Most offer beginner through advanced skills. After you have passed an assessment, you can display badges and achievements on your Academy for Ads profile and website. You’ll also be able to download a printable certificate, which is perfect for the office. The certifications are strong trust indicators for digital advertising and SEO consultants; they can help you display your expertise to potential clients. After completing an assessment, you can add a badge on LinkedIn and add skills to your online profile. You can share achievements with employers. Plus, companies can monitor course progress for an employee training initiative. To be accepted into the Partners program, you must complete at least 1 certification, as well as fulfill the spending requirements on the Google Ads platform. The Partners program comes with many benefits, including exclusive access to new Google Certification training tutorials and promotions. Google Adwords training all takes place in Academy for Ads. The platform offers Adwords training in several specialization areas, including search and display advertising, among others. If you’re interested in learning about Adwords, or you’re looking for AdWords certification, you’ll find great learning paths in Academy for Ads. how to become google adwords certified. Covers display topics including creating, managing and optimizing ads. Covers all things related to Google Search ads, including bidding, managing and measuring search ad campaigns. Covers mobile advertising topics including formatting, bidding and targeting your ads. Covers creating and managing video advertising campaigns. Covers Google Shopping advertising, including creating Shopping campaigns. Covers all things related to essential digital advertising and sales topics. Covers necessary programmatic ad topics, although a formal assessment isn’t currently offered. You can get Google Analytics certified on Academy for Ads, as well. Yet, the individual Analytics training courses are actually held on the Google Analytics Academy website. In Google Analytics Academy, you can take courses to prepare for Analytics Certification. In particular, Google Analytics for Beginners and Advanced Google Analytics courses are recommended before taking the certification assessment. This learning path covers basic through advanced Analytics skills, as well as planning, reporting and conversion tracking. “How to Become Google Certified” Tip: We recommend doing every Google Certification course at least once, especially the “Advanced Google Analytics” which requires more thought and time to complete. In Academy for Ads, there are a number of “learning paths,” outside of Analytics and AdWords. For example, there are courses and certification opportunities for almost all of the Google Marketing Platform products, and YouTube certification is available for a wide range of YouTube skills. Earlier this year, Google merged DoubleClick and Google Analytics 360 onto the Google Marketing Platform. There are several courses and certifications for Marketing Platform users. steps to becoming google marketing certified. Covers optimizing and developing mobile websites. Covers necessary and intermediate skills related to developed and optimizing media for Google ads. Covers campaign optimization, as well as video and search campaign management. Covers display and video advertising, as well as analytics. Covers search advertising and analytics on the Search Ads 360 platform. 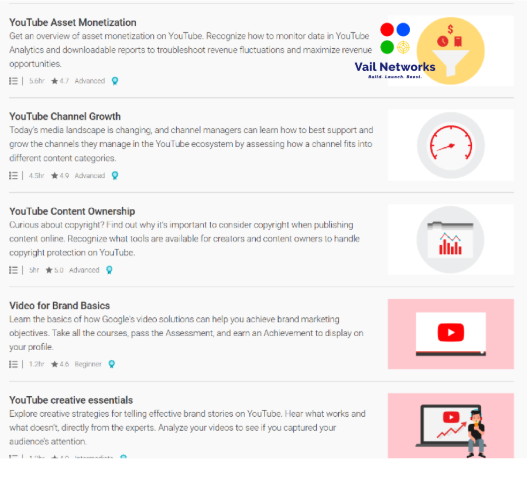 Important Note on YouTube Certification: There are a variety of courses in the YouTube section that cover a variety of skills from YouTube viewership growth to video branding. Covers all things related to monetization on YouTube. Covers basic through advanced skills for growing a YouTube channel. Covers copyright protection on YouTube. Covers beginner topics related to video production and distribution for brands. Covers intermediate skills in brand storytelling. Google Certification Tip: We also recommend that you watch our videos on How to Get More YouTube Views and Subscribers, as well as our Official Guide to YouTube SEO. These will also help you supplement your learning on your path to becoming Google Certified. To earn Google Analytics Certification, you have to pass the Google Analytics Individual Qualification (GAIQ). This is one of Google’s oldest certifications. Yet, it’s a little different from most Academy for Ads learning paths. In particular, you can only access the GAIQ exam on the Academy for Ads platform. The recommended courses, though, are available on Google Analytics Academy. To prepare for the Google Analytics Certification exam, Google recommends students pass the first two courses: Google Analytics for Beginners and Advanced Google Analytics. Both of these courses cover a wide variety of subject matter, from essential reports to complex analysis. Google Analytics for Beginners – This course provides a comprehensive introduction to Analytics over four units. Overall, the course takes about five hours to complete. Introducing Google Analytics – A basic intro to Google Analytics and its many uses. The Google Analytics Layout – An orientation to the Google Analytics’ dashboard. Basic Reporting – An overview of the Google Analytics reporting features. Basic Campaign and Conversion Tracking: A brief introduction to setting-up and tracking campaigns. Google Certification Tip: Familiarize yourself with Google Analytics. You can use the demo account, which uses data from the Google store. This tool provides a great way to test and try new skills. Advanced Google Analytics: This course covers in detail more advanced functions of the Analytics tool. Depending on your experience level with Analytics, it may take up to 8 hours to complete. Data Collection and Processing – A guide to managing and storing data. Setting Up Data and Configuration – Organizing all of your Analytics data. Advanced Analysis Tools and Techniques – In-depth tutorials on audience analysis. Advanced Marketing Tools – A primer on re-marketing and advanced targeting. Bottom line: These courses are very in-depth. So take your time as you work through them. The Google Analytics Individual Qualification covers all of these areas; be sure you’re proficient in each! Enrolling in and completing courses and assessments in Academy for Ads is very user-friendly. To start you’ll want to browse the courses. You can quickly see the time required for an entire learning path (course + assessment), as well as the skill level for the path. How long does it take to become Google certified? Courses and assessments take anywhere from 10 minutes to 1.5 hours to complete. You can see time estimates for completing an entire learning path (course + assessment) when enrolling for courses. You should be willing to dedicate at least two days to becoming certified for both Analytics and Adwords. We say two days because most marketing professionals are busy and need to allocate video watching and tutorials into blocks of 1 to 2 hours at a time. If you want to become Google certified, you should take the courses we recommend on the learning paths for Adwords (Academy) as well as Analytics. Watch the videos, take notes, and post questions when you don’t understand a concept. This will help you better understand all certification topics. One of the best things about Google Certification is that it’s free. 100%, no-charge. What is Google certification course? The Google certification course is actually a full, free program that gives you the opportunity to add to your online and digital marketing credentials. Exploring learning paths such as Analytics and Adwords, you will learn everything you need to know about digital marketing using Google’s suite of marketing tools. Google AdWords training courses cover beginner through advanced skills. Each learning path is clearly labeled by skill level. Most do require at least introductory, on-the-job experience with the product. The Google Analytics courses are slightly more challenging according to most digital marketing experts. You need to select the Google marketing or advertising product for which you are interested in becoming certified. all about the google adwords training courses and program. If a product has individual specialization areas, you can choose a specific learning path. How to Signup for Google Adwords Training and Courses. Once you’ve chosen a specialized path, you can then choose the type of learning Google certification learning path you want to pursue. In some cases, only one learning is available. how to become google ads certified. Google Certification Tip: For all Google Ads learning paths, students must first pass the Google Ads Fundamentals assessment. The Fundamentals course and assessment cover the most important Google advertising principles. To pass, you’ll need to earn an 80% or better. Once you have selected the course, you can take the assessment or begin studying the product. Courses are broken down by brief lessons, many about 10-20 minutes long. What’s the Difference Between an Achievement and a Certification? Google Certifications are accredited credentials. This is a formal achievement awarded by Google. After you earn Google certification (by completing a requisite assessment), you’ll receive a downloadable credential that you can display in your office or on your LinkedIn page. Certification exams are generally much more extensive. Achievements, on the other hand, are received after passing less-intensive assessments. For example, the Google My Business learning path has a shorter exam that results in a faster assessment and Google certification process. These are displayed on your Academy for Ads account, and you can share these on your LinkedIn account. These are not formal certifications. how to create an account for google’s academy for ads. First things first. You’ll need to create an account on Academy for Ads. 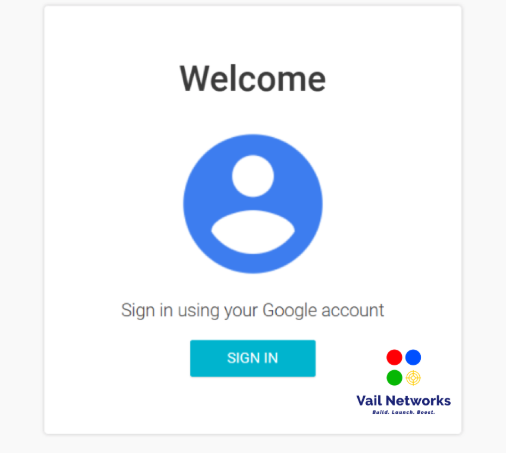 To do this, you will need to use (or create) a person or work Google account. Google Adwords Certification Tip: If you have an account linked to a Google advertising account, use that one. This will help you enroll in the Google Partners program. Once you’re in, you are ready to start learning. You can select an individual learning path and open the learning modules. Completing all the coursework prior to the assessment is a huge help in earning Google certification. Almost every Google certification exam has a companion study guide. These guides are helpful tools for prepping for a certification assessment. Although Google doesn’t offer practice exams for their courses, there are a bunch of helpful third-party practice assessments available online. The Google Analytics IQ Center is great for preparing for the Google Analytics Individual Qualification. You’re ready to take your certification exam. When you open an exam, you’ll be able to see how many questions and the allotted time. Most must be completed in 90-120 minutes, and have 65-100 questions. What If I Fail an Assessment? If you fail your Google certification exam, no need to fret. You can retake the test after 24 hours, but you’re free to take the exam as many times as you’d like. How Hard Are Google Analytics Certification Exams? Google Certification assessments are thorough, and they include anywhere from 65 to 100 questions per test. These Google Certification exams cover a wide range of topics – from introductory “easier topics” and exam questions - to tough advanced questions. Exams and assessments to Become Google Certified. What Score Do I Need to Earn to Pass? All Google Certification exams require you to answer 80% of questions right to pass. If you fail, you can retake the test at least 24 hours later. What Types of Questions Are Asked on the Google Certification Exams? Almost all questions are multiple choice. You’ll be asked about all of the areas covered in the learning path, from introductory topics, to advanced subject matter. 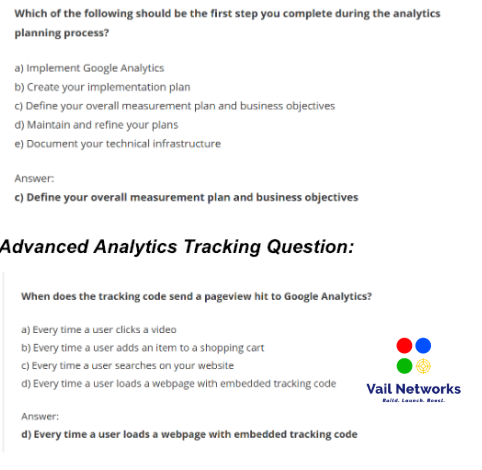 In the Google Analytics course, for example, users are asked general questions, as well as questions on more advanced topics like Analytics Tracking Code. How Long Will I Have to Complete the Google Analytics Certification Test? Google learning path for certification: time required to complete. Can you search online while taking your Certification exams? Google does use some safeguards to discourage this. But for the most part, you can use notes and other materials to complete the questions. If you study and complete the course activities, though, there’s really no need to search online while you are taking the exams. If you have working knowledge of the tool, you’ll have a good shot of passing the test on the first try. Enrolling in courses and earning certifications in Academy for Ads is completely free. Students don’t pay for courses, test prep or the actual exam. The only real cost is an investment of time. However, if you are hoping to reach new heights in your career as an online marketer or digital marketing professional, the time spent to become a certified Adwords professional is worth it. To earn formal Google Certifications, you’ll spend up to 10 hours completing one of the AdWords training program modules. In some cases, you may have to take a Google certification exam more than once, and you’ll need to re-certify every 18 months. In other words, Academy for Ads puts tons of great AdWords training programs at your fingertips for FREE. There’s really no risk to trying out a course, and they offer beginner through advanced skills. You can easily pay $500 for a Google Analytics course through third-party sites, yet even if you do take one of these courses, you’ll still need to take a certification exam to earn the credential. Now You’re Ready to Become Google Certified. Click to Learn about Google Certification! As you can see, Google Analytics Certification and AdWords certification can make all the difference for your business. Following a learning path will help you operate more efficiently, learn new skills with Google’s marketing products, and ultimately, become a fully-certified Google Analytics, Ads, or Marketing Platform expert. And you can become Google certified for free! But remember: These learning paths can be intensive. Leave yourself enough time to fully immerse yourself in the coursework. Read up on the study guides, and be sure you take a practice exam. If you do those steps, you’ll have a good chance of earning Google certification. 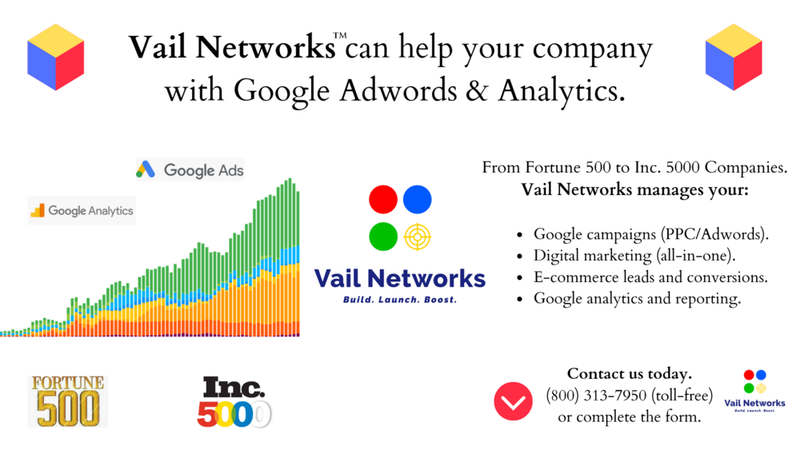 The digital marketing team at Vail Networks can help you with all of your Google Adwords and Google Analytics. In fact, we manage campaigns for several amazing brands from the Fortune 500 to Inc. 1000. Contact our digital marketing team today to learn how we can help you. We highly recommend that you read our official guides on marketing, which you can find here: Official Guide to Landing Pages and Converting Leads, as well as our Official Guide to What is SEO and How it Works.